Flo over at nonstopnerds (great site) posted this simple but hilarious Star Wars spoof entitled, "Bar Wars." 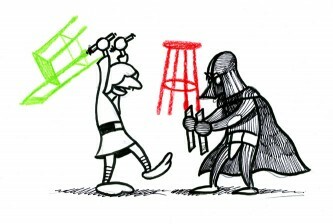 He even got the bar stool colors to match Luke and Darth Vader's Lightsabers. My money is on Vader in a bar fight. Awesome!